Ellen Hart was named the 2017 MWA Grand Master, the most distinguished lifetime achievement award offered in the mystery community. 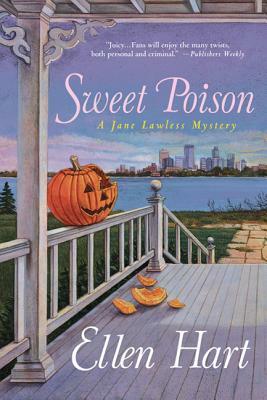 Lambda and Minnesota Book Award–winning author and MWA Grand Master Ellen Hart delivers another high-caliber mystery with Sweet Poison, her newest Lambda Award Finalist in a mystery series as loved for its delightful charm as for the absorbing psychological depth of its characters. Jane Lawless is at her wit's end keeping her Minneapolis restaurants running while volunteering on her father's campaign for governor. With a solid lead, the race is Ray Lawless's to lose, but that changes when his rival posts a list of criminals who are on the streets, thanks to Ray's work as a defense lawyer. Corey Hodge is one of the ex-cons who took Ray's advice to plead guilty for a crime he swears he didn't commit, and revenge is never far from his mind. Then one of Ray's volunteers is killed in such a way that mirrors the crime Corey was convicted of, and Jane must bring in the killer to save her father's political career and to keep Corey from going to prison again. The high stakes and intrigue that fuel Sweet Poison make for a gripping novel of ambition and obsession. ELLEN HART, “a top novelist in the cultishly popular gay mystery genre” (Entertainment Weekly), is also a Lambda and Minnesota Book Award winner. The author of more than twenty mysteries featuring Jane Lawless, she lives in Minneapolis, Minnesota. In 2017, she was chosen as a Grand Master by Mystery Writers of America (MWA).